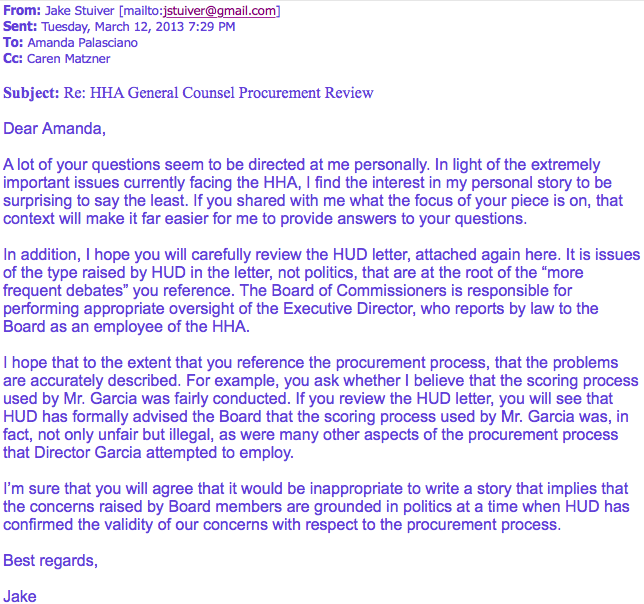 As noted earlier today, an inquiry to the Hudson Reporter on its failure to ever report on the scathing Housing and Urban Development report calling Carmelo Garcia's rigged approval of the 2013 legal counsel contract "legally flawed" yielded no reply. HUD made the designation on the procurement of a reissued contract against renewing HHA counsel Charles Daglian but the Hudson Report had a singular focus on everything but those troublesome findings. Similarly, the Hudson Reporter would completely ignore and never report on the 2014 HHA audit report listing numerous problems under the controversial stewardship of Carmelo Garcia. 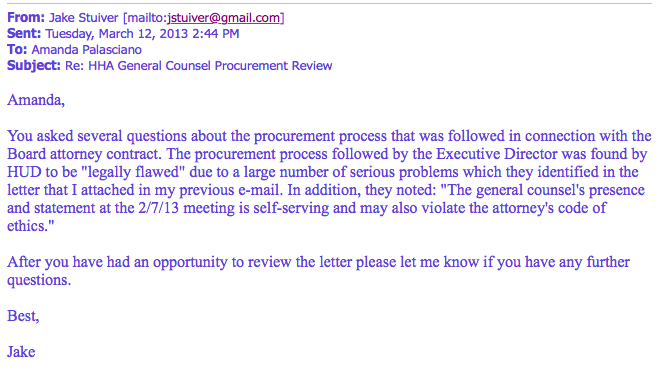 Back in March of 2013 however, emails between the former Hoboken Housing Authority Chair, Jake Stuiver exchanged with the Hudson Reporter and its editor Caren Matzner revealed a solitary focus on a failed resolution for Florio Perucci and absolutely no interest in the contract actually reissued to the lightening rod counsel aligned with Garcia in Charles Daglian. Leading into that vote by the HHA board of commissioners, Daglian acted as counsel in the same 2013 HHA meeting where Carmelo Garcia warned of personal consequences, both ethical and criminal if HHA commissioners failed to reissue an approved contract. The Hudson Reporter kept mum on all the problems stemming from that early 2013 contract approval as it would later ignore the 2014 audit report and the implicit serious questions of insubordination, competence and later further ethical and possible legal conflicts under Carmelo Garcia. These are actual, unedited emails originating with the Hudson Reporter being handed the federal report from HUD. 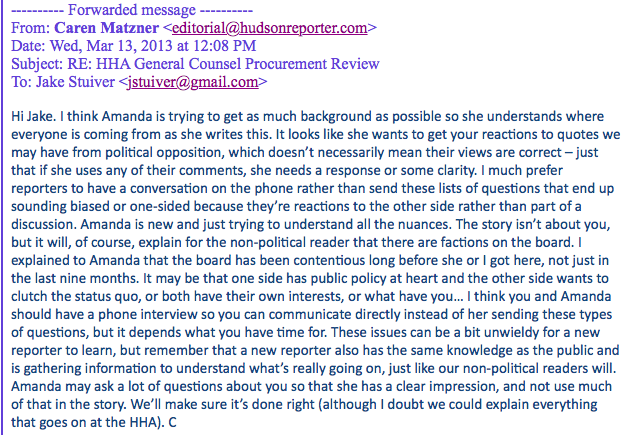 After Amanda Palasciano, then a rookie reporter for the Hudson Reporter is emailed the HUD report, the response show a different agenda entirely with apparently no interest in the HUD report itself. Palasciano would soon voice support for Garcia's NJ Assembly campaign on her Facebook and follow months later acting as a communications manager on the 2013 Tim Occhipinti mayoral campaign backed by Beth Mason and developer Frank "Pupie" Raia. 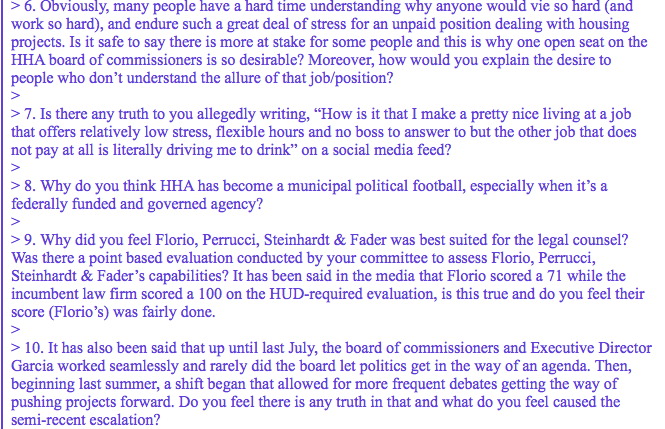 After the conversation immediately shifts into the motives of Chairman Stuiver's service, a lengthy list of additional reporter questions focus on the failed bid of Florio Perucci before concluding on the wonderful reign of then HHA Executive Director Carmelo Garcia. Perhaps a rookie reporter had little knowledge on why the HHA under Garica ran "seamlessly" with no real oversight by a working board of commissioners or that Garcia himself designed a scoring system rigging the top vendor for the legal counsel contract multiple times pushing it before the board on almost SEVEN occasions but never seeing it passed. That's no typo. Carmelo Garcia offered up Charles Daglian more than half-a-dozen times attempting to force the HHA board of commissioners to submit to his counsel demand. In the email below, a reply raises the HUD report again and the report's serious findings highlighting strong concerns about the legal ethics involved in Daglian sitting on a meeting to see his contract reissued. To no avail, the response turns back to the failed resolution turning down Florio Perucci. There's no interest in any of the serious matters raised in the earlier APPROVED legal contract. The discussion goes back to the direction, some might say sole focus on what one Carmelo Garcia would see as "problematic." A tepid response by the rookie reporter assures there will be some highlighting of the HUD report. It never of course finds its way into print. Concern is raised on the personal focus of the reporter's inquiry. Once again, an attempt is made to refocus on the serious matters highlighted by the HUD report. 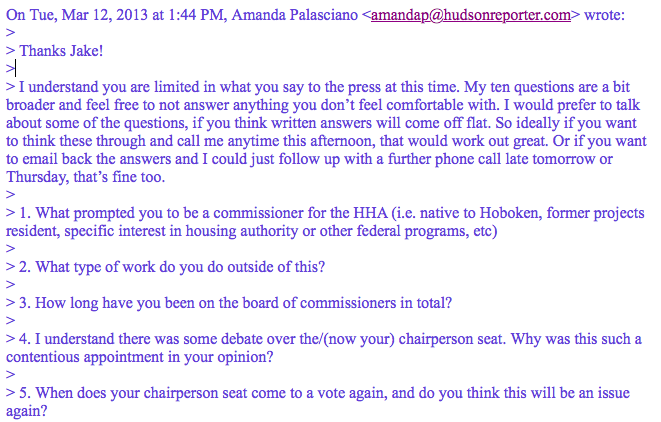 This time the Hudson Reporter editor Caren Matzner is looped into the email. Caren Matzner attempts to intervene and assures that this isn't personal and there's longstanding issues with the HHA which may arise and be reflected in an upcoming story. She urges there be a phone discussion as the HHA Chairman is clearly responding to what looks very much like a set-up or a hit job. Once again, there's zero interest in the serious findings raised in the HUD report or the reissuing of a contract to what many see as Carmelo Garcia's "personal attorney" not a counsel acting in the actual interest of the HHA board of commissioners. Smelling a rat, another opinion is requested. The conclusion: it's a rat hit job by the Hudson Reporter with no interest in reporting the actual news but manufacturing a story to ignore the actual news in the HUD report. report undoing Carmelo Garcia on a legal contract. in that contract but imaginary ones it sought to pin on Councilman Ravi Bhalla. Talking Ed Note: Is this typical "journalistic" behavior by the Hudson Reporter? Ask anyone in the Reform Movement especially after Dawn Zimmer became councilwoman and then mayor and you'll not be surprised to hear, "same ole, same old." And that is why MSV is proud to designate the Mason Media Complex award to the Hudson Reporter. Related: Grafix Avenger published a must read feature on the ELEC report of the PAC led by John Keim and Ines Garcia Keim: Real Democrats for Hoboken. A flood of monies came from Beth Mason and her husband, Richard G. Mason of Wachtell, Lipton, Rosen & Katz.